Very nice campground. Only stayed for one night, did not use any of the facilities. Very well maintained, nice paved roads and sites, both pull-through and back-in. Had a nice walking trail around the park, and a beautiful lake. Would definitely stay here again. Many families present and kids allowed to run amok - in street playing games, dragging trash and sand in bathrooms - bathroom cleaning crew did great job. Other staff at campground were either rude or in the case of the mowing crew, dangerous as they mowed right into campers sitting at their table, mowed over lawn carpet, and left other sites unmowed. Mix of good and jerk seasonal campers; Rules very inconsistently enforced based on attitude of staff working who need to show their authority when convenient or if they know the camper. Expensive ice, firewood, and other supplies at small, thinly stocked store. 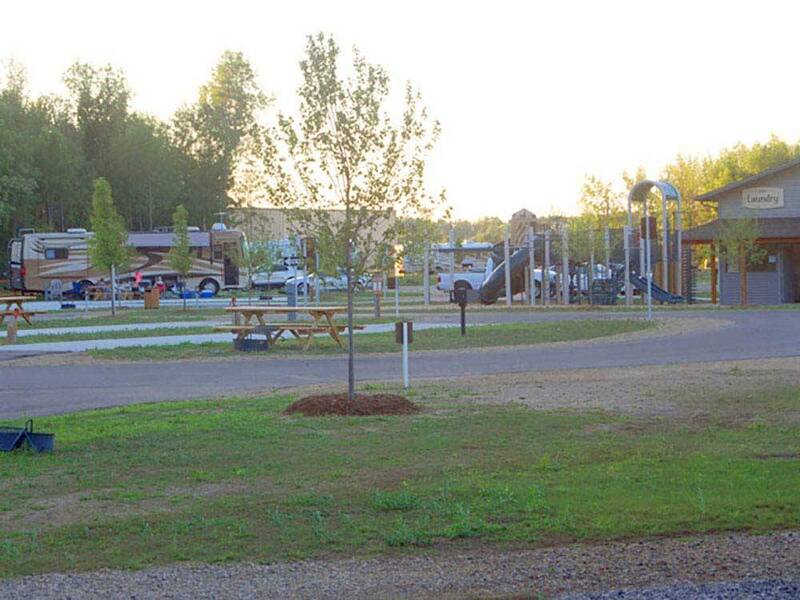 Good Morning - Thank you for visiting Soaring Eagle Hideaway RV Park this season. We appreciate you taking the time to let us know that our Housekeeping Team was quickly taking care of any messes in the restroom areas. There is absolutely no excuse for dangerous mowing though. We sincerely apologize for any safety or comfort issues this caused to you or any of our guests. We are happy to say that we have hired a new Manager and that we are working diligently to ensure all of our rules are upheld on a fair and consistent basis. We hope you give us another chance in the future to see all the great improvements we are making. Again, we appreciate your feedback and thank you for visiting! The park is overpriced - I paid $67 with Good Sam Discount. The park gives you access to a very nice pool at the hotel (which you have to drive or take shuttle to) but little else. We had problems with low voltage causing our surge protector to cut out. They were very slow to send maintenance and couldn't fix. We ended up leaving early, was told we would be refunded but they didn't and argued with me on the phone after I got my credit card bill. I will not stay there again. Thank you for visiting Soaring Eagle Hideaway RV Park. We regret to hear of the inconveniences you experienced during your stay. We also offer many other amenities including but not limited to Watercraft Rentals, fishing, a beach/swimming area, and Water Trampoline available for our guests to enjoy on our 42-acre lake. We are sorry to hear you were not able to enjoy our other amenities but are happy you enjoyed the hotel pool. We appreciate you taking time to provide your feedback so that we can make improvements for the future. We will forward your review to our Management Team so issues with the voltage can be reviewed. Thank you again for visiting. We stayed at the Soaring Eagle Hideaway for a week while we explored Central Michigan. The park was clean and well maintained. The park's season ends October 31st so the pool was closed, and I could not rate it. It is a newer park. The RV spaces are nice and level. There are pull through and back in sites. The only negative is that the streets are narrow and if you have a longer RV and tow you may have some problems maneuvering into a site. We had some difficulty and ended up having to unhook our trailer and put it in the site next to us. If you are under 60' with tow I would recommend the park. If you are over 60' please make sure you plan on having to disconnect, just in case. They do offer free shuttle service between the Waterpark, Casino and RV Park. Thank you for visiting Soaring Eagle Hideaway RV Park! We appreciate you taking time to provide your feedback regarding your visit. Soaring Eagle Waterpark & Hotel provides a hotel pool, hot tub, and steam room for our guests to enjoy. This feature is available to our guests for the entire season and is accessible by the complimentary shuttle service. We regret that you were unable to take advantage of this feature. We are happy to hear you found our park clean and well maintained! Again, thank you for your feedback and for visiting! Very nice RV Park. Very clean and nice lake. Bathrooms are nice but showers could use a little attention, need mats outside shower to prevent slipping. Thank you for visiting Soaring Eagle Hideaway RV Park! We are happy to hear you found our park very nice! We appreciate your feedback and thank you again for visiting!